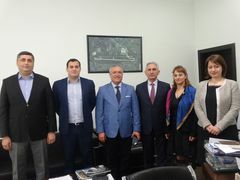 On 4 may 2015 within the working visit to Ministry of Economy and Sustainable Development of Georgia, Mr. Mircea Ciopraga, Secretary General of the PS IGC TRACECA met with Mr. Guram Jalaghonia, Director of Georgian Civil Aviation Agency. Taking into account EC and ICAO recommendations as well as international standards and recommended practices in aviation sphere, participants of the meeting focused on the main points of discussion in the field. Mr. Ciopraga and Mr. Jalaghonia underlined that ensuring safe and better functioning of civil aviation is one of the highest priorities. Mr. Jalaghonia informed that by signing Common Aviation Area Agreement with EU Member States, Georgian Side once again expressed its full readiness and aspiration to achieve the full harmonization with mentioned EU standards and regulations. The process of appropriate reforms and legislative changes continues actively up till now. In view of the ongoing “TRACECA Civil Aviation safety II” project and their latest progress report, the parties also exchanged views on the status of the current project, latest activities and effectiveness of the implementation. Mr. Ciopraga stressed that enhancement of joint cooperation among all beneficiary and non beneficiary countries will contribute to the further successful implementation of the TRACECA projects, including civil aviation field. 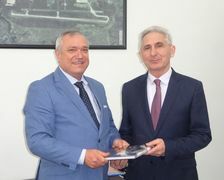 In addition, Mr. Ciopraga congratulated Mr. Guram Jalaghonia as the Georgian side became full participant of all Seminars and Working Groups held within the framework of TRACECA Civil Aviation II project.